Baroness Sayeeda Warsi is standing, surrounded by large sacks of African chillies, having an animated conversation with a former nuclear submarine engineer about his new range of hot sauces. Since we met five hours ago, we’ve already launched the Tories’ Welsh local government election campaign in Newport; visited the first “wireless” town centre in Monmouth; and toured a women’s refuge in Cardiff. But for the moment, as we sample the Hot Diggidy Dog sauces (“You just can’t take the spice,” Warsi jokes), Simon Llewellyn, the firm’s boss, wants to bend her ear about bank lending. “You can only get a loan now if you’re already successful enough not to need it,” he laments. She listens, suggests a new government scheme which might help him, and when he still seems downbeat promises to personally deliver a letter of complaint to the Treasury. Then we’re off again. Ahead is a party fundraising evening (with a “luxury” pub finger buffet) in the Vale of Glamorgan and a three-hour drive to the Salford Premier Inn for the night. And that’s day one. Tomorrow we’ll tour the new Blue Peter studio, watch five former Lib Dem councillors in Rochdale defect to the Tories and visit a steam railway in the Rossendale Valley before Warsi heads off to Preston for more visits and then a fundraiser in Penrith. As co-chairman of the Conservative Party, Warsi, 41, does these 48-hour visits around the country every week for nine months of the year. It is a gruelling schedule, but there has been little sympathy for her among some of her Tory colleagues in Westminster. Some have sounded less than impressed with their chairman. Anonymous briefers in Westminster variously paint her as a “lightweight” not up to the job; “over-promoted” because of her race and gender; never elected to office; “not to be trusted” for big media performances; and about to be sacked in a reshuffle. So are they right? KARACHI: Baroness Saeeda Warsi, the first-ever Muslim member of the UK’s Prime Minister David Cameron cabinet, said that Pakistan’s democracy has a bright future but for that the democratic process should be allowed to continue. Warsi said that the time is approaching when current democratic government in Pakistan will give way to another democratic government. “Handing over power to another democratically-elected government through a democratic process will be a historical moment for Pakistan,” she said and added she is hopeful one would be able to see the emergence of great democracy in the future. “But to move forward for a better future, we have to allow this process of growth to take place and we need to be patient,” she stressed. Warsi said that she was quite optimistic about the future of Pakistan and that things will improve, adding Pakistan has a lot of potential which needs to be discovered and utilized properly. She said that during her visit to Pakistan in January this year she met a large number of businessmen and professionals which made her to realise that people have mixed feelings about the future of Pakistan. “I believe in social action and I think if you can bring people of different backgrounds to work together to attain a single goal, it will help build better relations between the two,” she said and added she had embarked on several social action projects in several countries where parliamentarians and/or politicians worked together on one project for the betterment of the whole and this helped build bonds between them and they interacted in ways that would have probably been difficult otherwise. Warsi stressed that the politicians as well as people should not wait for others to do the work instead they should get together for a particular goal. 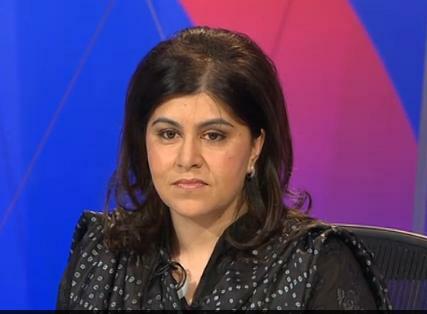 Sayeeda Warsi is in her CCHQ office, pondering what her mother thinks. She may be co-chairman of the Conservative Party, a privy counsellor and the first ever female Muslim cabinet minister, but it seems parental approval of her life choices is not easily won. “My mum wanted me to be a lawyer and she chose my husband [for an arranged marriage]. And I’m now divorced and remarried, and a politician: so you can read from that what you want,” she says. Hints of maternal disappointment certainly don’t seem to dampen the bubbly enthusiasm of the woman who has, in many ways, come to embody David Cameron’s modern Tory party. In at the ground floor with the Cameron project, Baroness Warsi is now not just a minister but also the PM’s anti-Lib Dem and Labour attack dog, his elections field marshal and – increasingly – his personal envoy in key strategic countries overseas. Crucially, she also tries to combine the modernising message of the Conservatives with a thoroughly traditional approach to the party’s core values and history. Her own small office in Millbank Tower is a microcosm of the mix of old and new. Hung on her wall like an artwork is a heavy black leather briefcase with the forbidding words ‘Chairman of the Conservative Party’ emblazoned on its side. It’s an artefact that reeks of the history of past chairmen such as Norman Tebbit, Rab Butler, Willie Whitelaw and others. But just underneath is a black and white Andrew Parsons portrait of a relaxed Mr Cameron, jacketless and sleeves rolled up, alongside Warsi herself. She jokes that the photo makes it “look like David is going to punch me”. 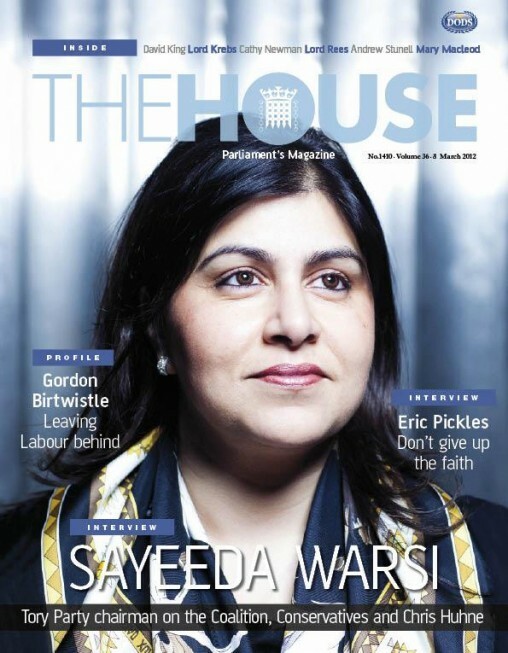 Sayeeda Warsi, 40, co-chair of the Conservative party and minister without portfolio, is the first female Muslim to serve as a minister in a British government. She was made a life peeress in 2007. To be one of the Famous Five; free in a place without too many rules. Birkdale High School; Dewsbury College and then Leeds university. My education was a privilege. A lot of Asian girls had traditional parents, and had to fight to stay at school, while my parents were very encouraging. A law teacher at college called Andrea. Her approach was life-changing. Dad, who’s always had a get-up-and-go approach. In terms of politics, Michael Howard. More than I was six months ago. I could run for two minutes back then, now I can run for 30. Success comes because people are in the right place at the right time. Right now, my political commitment is my life. As the traumatic events of the weekend show all too vividly, Pakistan is one of the most turbulent and unstable countries in the world, and a diplomatic nightmare. 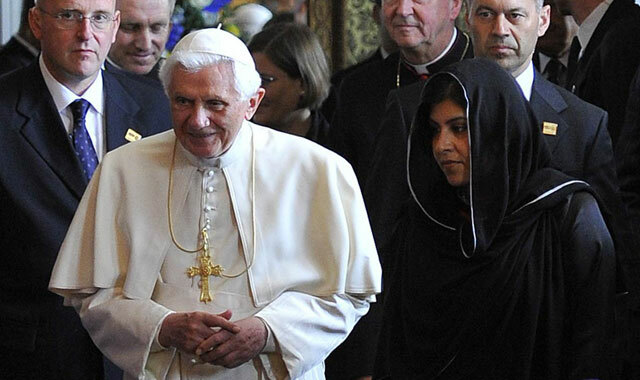 But Britain has a secret weapon – Sayeeda Warsi. 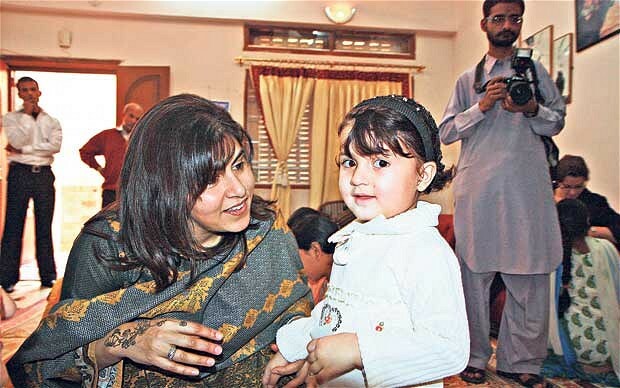 With her Punjabi heritage, local languages and easy manner, the Conservative Party chairman can reach parts of the Pakistan political system that other government ministers cannot. As I witnessed at first hand last week, David Cameron has licensed Baroness Warsi to operate as Britain’s unofficial envoy. The Tory chairman flew into a first-rate crisis set off by the potentially deadly stand-off between government and military. The defence secretary had just been fired. Within hours she was at the Pakistan foreign office for a meeting lasting well over an hour with Pakistan’s newly promoted – and extremely beautiful – foreign secretary, Hinna Rabbani Khar. Just 34 years old, the University of Massachusetts-educated Khar is the latest star phenomenon to hit the Islamabad scene and is suddenly being tipped as a potential successor to Asif Ali Zardari, should the government fall this week. The Tory party chairwoman, Baroness Warsi, has accused her Liberal Democrat counterpart of treating the coalition like “a bad episode of Come Dine with Me” by enjoying the good things on offer and “then slagging it off afterwards”.